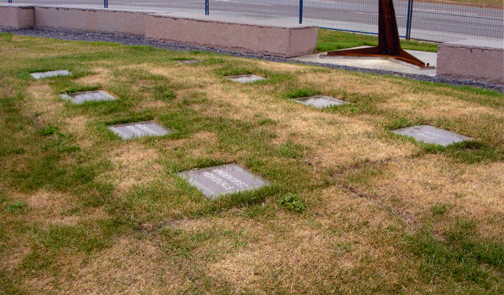 The following fifteen pictures are of the memorial monuments erected by the City of Edmonton commemorating the Traditional Burial Grounds and Fort Edmonton Cemetery at Rossdale. 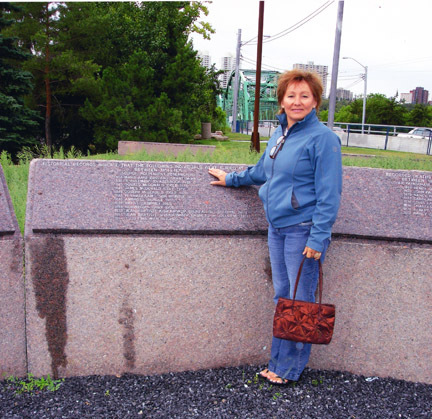 The commemoration date was Friday, August 10, 2007.
through her son, John F. Grant and his first wife, Louise. Louise Umphreville - Wife of John Rowand Sr.; mother of Marie Anne Breland & Nancy Rowand. Nancy Rowand - Daughter of John Rowand & Louise Umpheville. Marie Anne Breland Grant - Daughter of Pierre du Boishu dit Breland & Louise Umphreville. 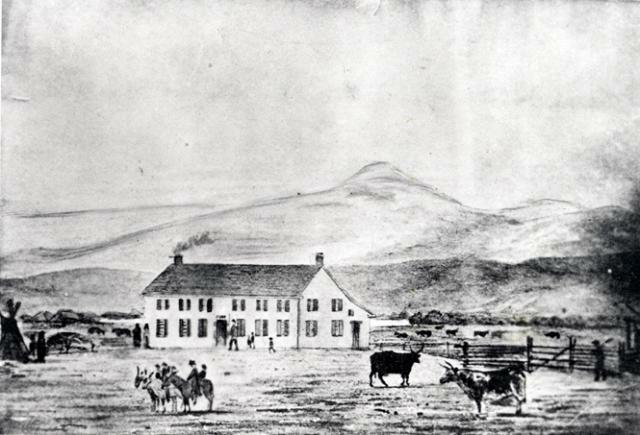 Homestead of Johnny Grant, son of John F. Grant & Quarra. 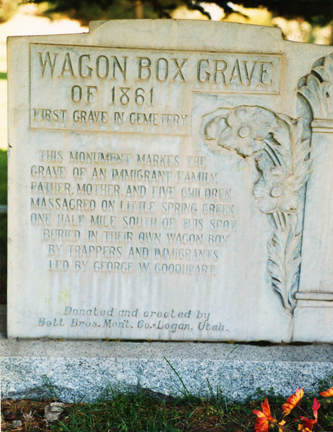 "Wagon Box Grave of 1861 ~ First Grave in Cemetery ~ This monument marks the grave of an immigrant family. ~ Father, mother, and five children massacred on Little Spring Creek one half mile south of this spot. ~ Buried in their own wagon box by trappers and immigrants led by George W. Goodhart." 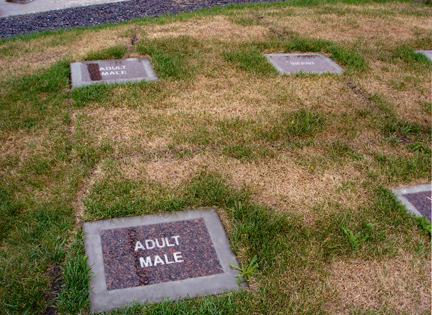 Since the tragic deaths of its occupants, the Wagon Box Grave has been recognized as the first grave in the Soda Spring cemetery. In recent years, the lava rock has become recognized as a grave marker. Research and substantiating information concludes Richard Grant died in 1852 and that the lava rock marks his resting place. John F. Grant's Montana home, built in 1862. Johnny Grant's 'lazy g' horse brand, brought with him from Montana to Manitoba. (R) Wood stamped with the brand. The " g" measure 4 inches long and 1.5 inches wide. (L) The lava rock, above, marks the grave of Richard Stanislas Grant, son of HBC Chief Trader Richard Grant and Marie Anne Breland, brother of John F./Johnny Grant, and husband of Emilie Levreault de Langie. 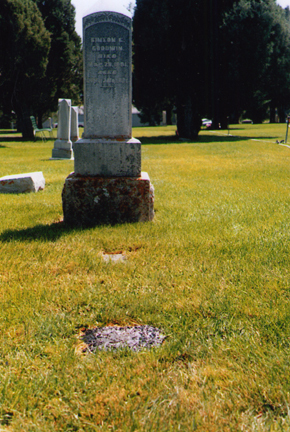 In 1852, Richard was shot by an Indian at or near the Bear River. He died of the wound and was buried by the river. Later, because of flooding, family and friends moved him away from the flood areas, and reburied him at what later became Soda Springs. 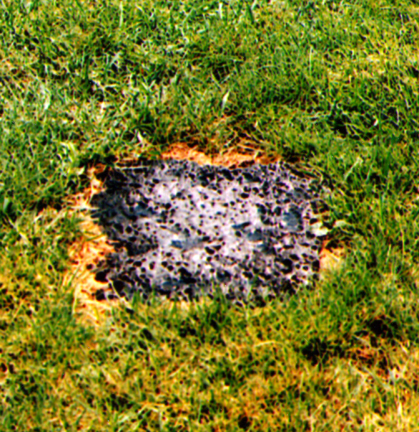 This large lava rock was placed over his grave as a marker. Since then, the Soda Spring cemetery has developed and the lava rock is now close to the centre of the cemetery. 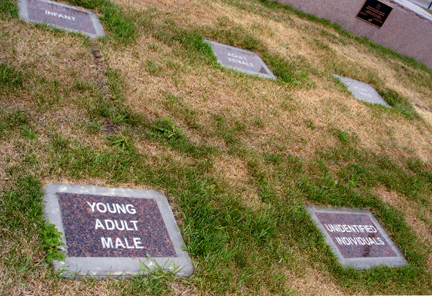 (R) The lava rock placed in proximity of other cemetery markers. 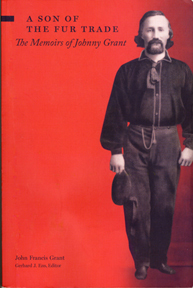 Born in 1833 at Fort Edmonton, Johnny Grant experienced and wrote about many historical events in the Canada-US northwest, and died within sight of the same fort in 1907. 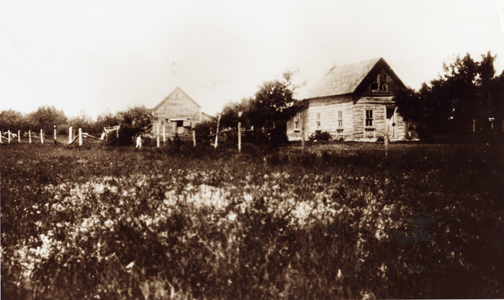 Grant was not only a fur trader; he was instrumental in early ranching efforts in Montana and played a pivotal role in the Riel Resistance of 1869-70. 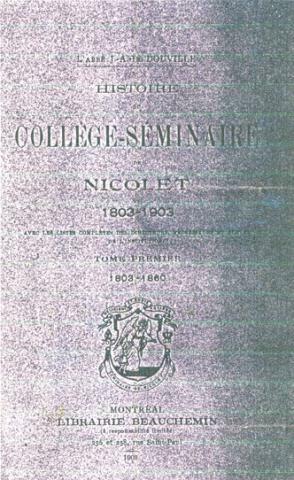 Published in its entirety for the first time, Grant’s memoir—with a perceptive introduction by Gerhard Ens—is an indispensable primary source for the shelves of fur trade and Métis historians. The Hudson's Bay Company first awarded medals for long and faithful service to commemorate the 250th anniversary of the Company in 1920. Silver medals were awarded for 15 years of service and silver clasps were given for each five years of additional service. With 30 years of service gold medals were issued and gold clasper were awarded for each additional five years of service . A total of 393 individuals qualified for the gold award and 1,981 received the silver medals. 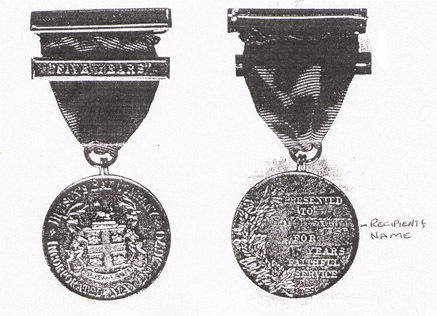 The awarding of medals and clasps was discontinued in Canada in 1949 and in London, England in 1968. In April, 1921, Joseph Richard Grant was one of the 393 individuals to receive the gold medal plus one gold bar, representing 35 years employment with the Hudson's Bay Company. The whereabouts of his medal and bar are unknown but would like to be known. 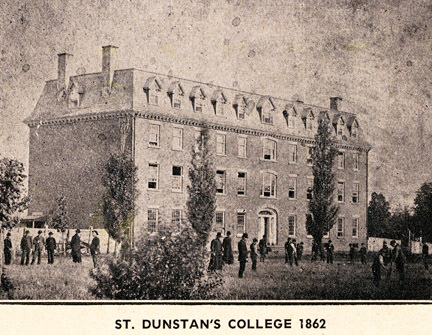 St. Dunstan's College, Charlottetown, P.E.I. 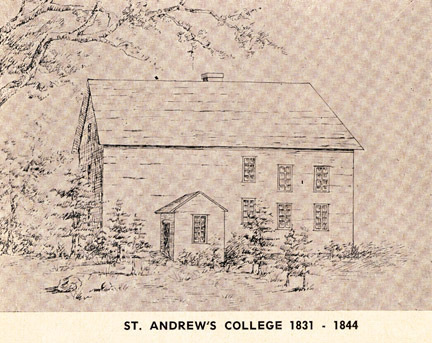 The college as it originally looked and as it looked when J. Richard Grant attended it from 1861-1866. 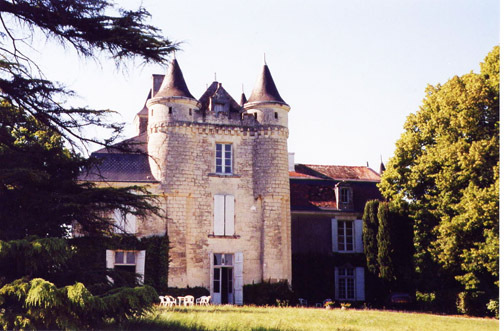 Left: Tour de Naintre, once the family home. 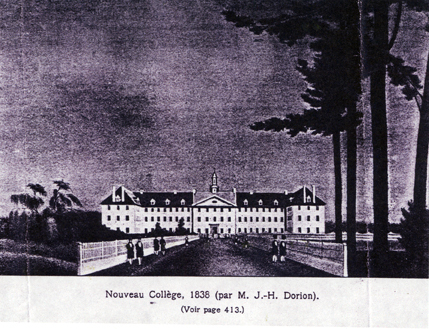 The last member of the family to live here were the grand parents of Leon-Joseph Levreault de Langis, Charles and Marie Mesnard. 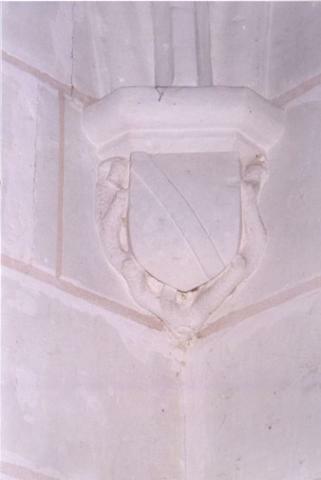 When he died in 1628, his wife lived there a short while longer, but had to sell the house. 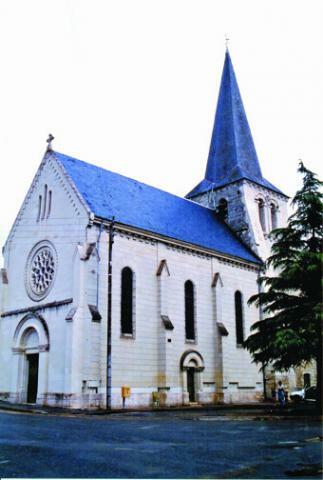 Left: Church at Naintre, France. 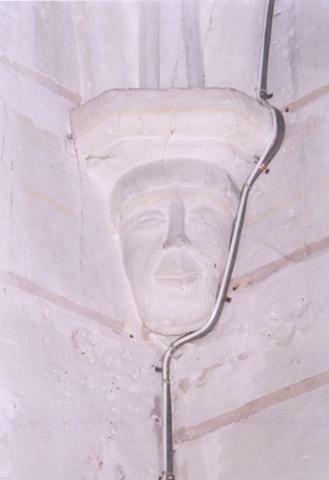 Left: Bust of one of the Levreault family members. the family member. Pre-French Revolution.